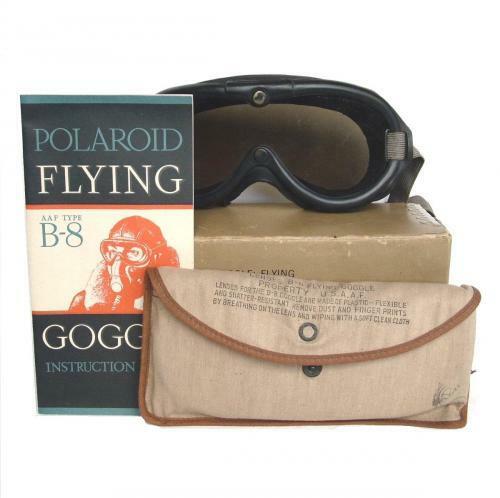 Goggle; Flying Type B-8. By the Polariod Corporation. The rubber frame is marked 'Flying Goggle A.A.F. Type B-8' and is in excellent condition throughout. This pair has never had a chamois backing. The strap is also very good and retains elasticity. Fitted with a tinted 'anti-glare' lens in good order. Comes with the original 7 page Polariod instruction leaflet and correct B-8 cotton pouch containing all 8 spare lenses - greens, amber and clear tints. These appear to be in good to very good condition bar the usual minor warping. All contained in the card carton of issue. Overall this is a very good to excellent complete set of goggles/spares. Stock code G21049.